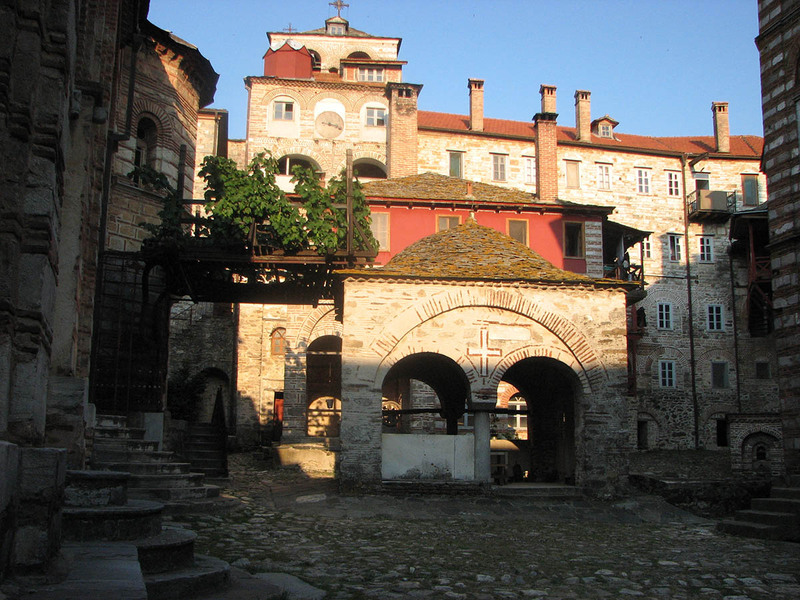 The Monastery flourished during the 13th and 14th century and in the middle of the 16th century a school of Serbian literature prospered which however later began to decline in the 17th century. 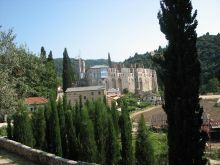 In 1722 the monastery was destroyed almost completely from fire. 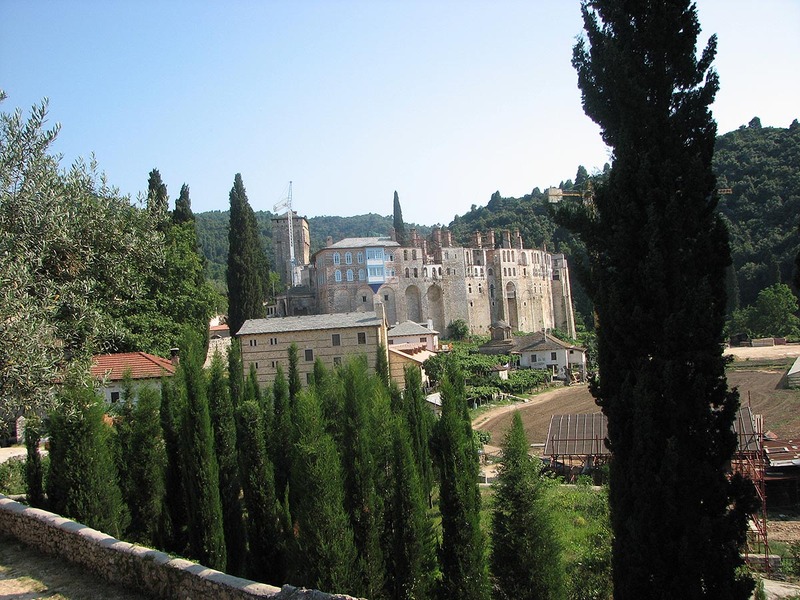 In 1676 when the archdiocese Ipekiou merged into the Ecumenical throne, the Serbs monks left. 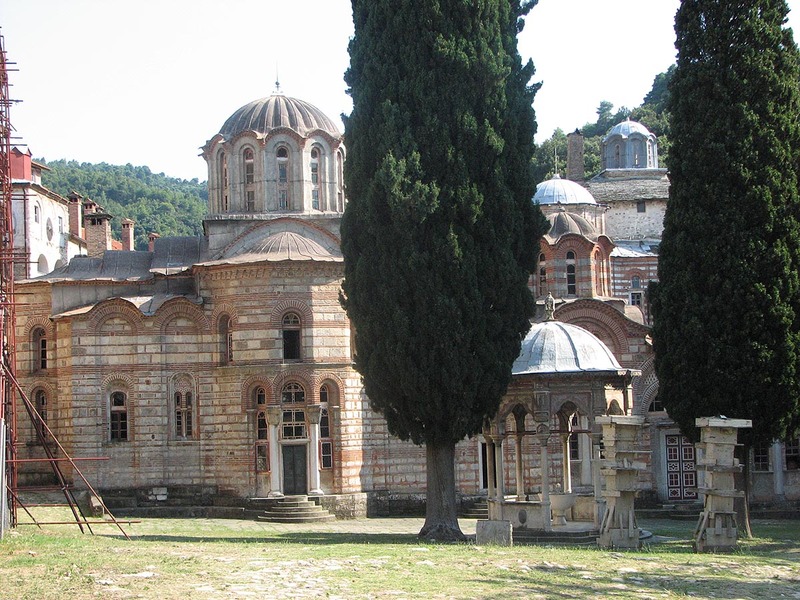 But they prevailed again in 1896 after the visit of the King of Serbia Aleksandros I who was responsible of the renovation of the Monastery and the repayment of its debts. The Monastery of Helandariou honors the Virgin Mary as Abbess as well from the time when the monks tried to put the image of Panagia Triherousa at the iconostasis of the Katholikon and the holy picture disappeared and reappeared at the throne of the abbot. The Katholikon of the Monastery is devoted to the Presentation of the Virgin Mary (21st November) and was founded in 1293 by Stephen Urosch Milutin. 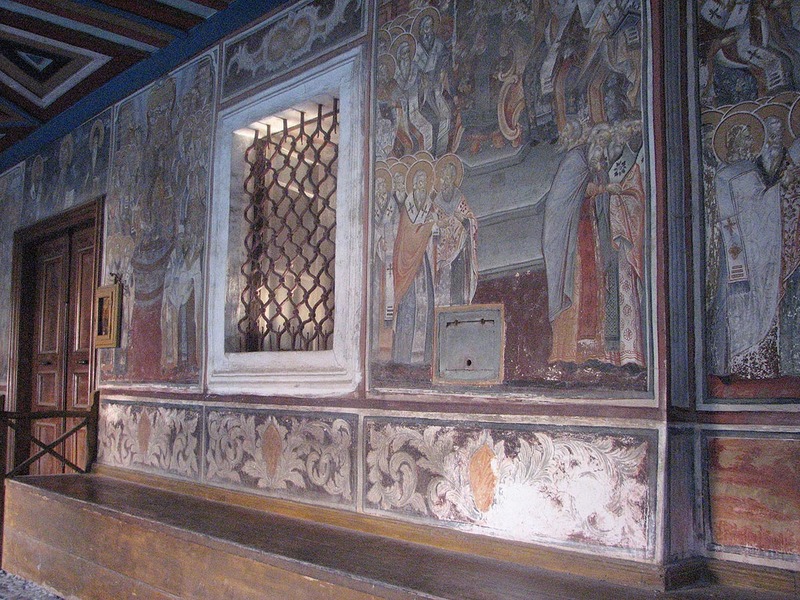 His murals were painted in 1319 or 1320 and were repainted in 1803. 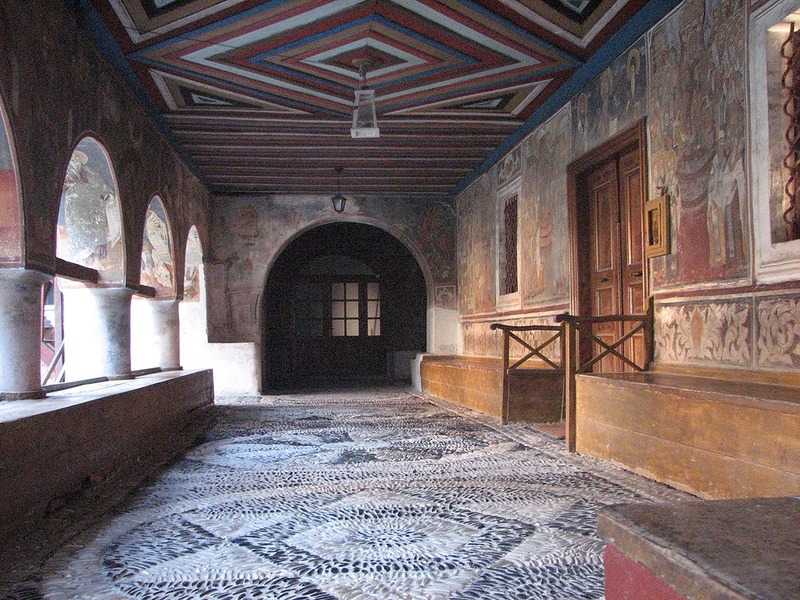 The stoup in the middle of the courtyard was constructed in 1784 and it was painted in 1847 by the painter Makarios. Behind the throne of the abbot is the tomb of St Simeon. One day from the tomb of the saint a grapevine grew which flourishes until today and it is said that it can treat sterile women. 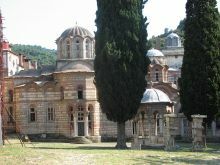 The Monastery of Helandariou owns 9 chapels within and 8 outside as well as the attached monasteries Zigos, Agios Vasileios, Komitissis, Kalitsa, Paparnikia, Omologitou, Strovilea, Scorpios and Agios Georgios. 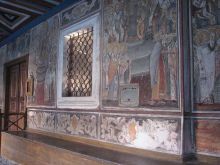 At the old Prothesis frescoes from the 1629 have been preserved which however cover those of the 14th century. The library contains 700 Slavic manuscripts and 100 Greek ones, 25 Slavic parchments and 27 Greek ones, 7 scrolls from which 2 are Greek, 6,600 printed books 1000 of which are Greek. 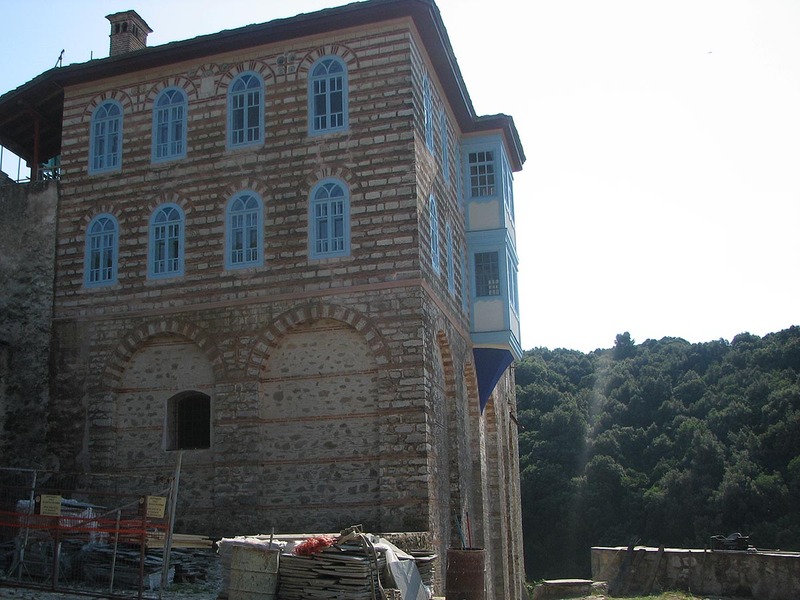 It also contains more than 400 stamps and documents, among which are the golden seals of Byzantine emperors and an enormous and important collection of books of Serbian literature of past centuries. Finally there are 7 Greek and 5 Slavic very old scrolls. Among the precious relics and offerings there are five precious stones with characteristics of the Virgin Mary, Christ and Agios Dimitrios from the 12th century and 2 carved wooden crosses containing pieces of the Holy Cross. Other priceless heirloom is the Winding Sheet of Christ and pieces from the thorny wreath, part of the trimmed skull of Prophet Isaias, the right leg of Agios Panteleimonas, the right hand of Nikoforos Patriarchis of Constantinople, part of the remains of Agia Varvara and Agia Ekaterini. 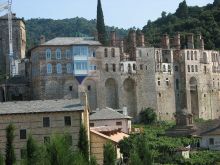 Many of the relics were gifts by Serbs kings and Russians tsars. Among the most important relics of the monastery is the miraculous picture of Virgin Mary the 'Triherousa' with gold plated trim and with various ancient coins among which are those of Alexander the Great. There are even miraculous pictures of the Virgin Mary: The 'Galaktrofousa', the 'Ekklisiarchi pedefthasis', the 'non-burnt' on the big fire in 1722, the 'Akathistos' and the Serbian 'Papadiki' (Popskaya). The original picture belonged to the family of Ioannis Damaskinos. Ioannis was a Christian and simultaneously an adviser to the Caliph Walid of Syria for matters related to the Christian population. 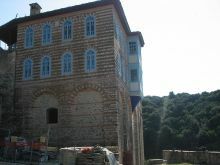 It is said that his views against the iconoclasts caused the reaction of the palace in Constantinople. Because of his attitude it was arranged for a trap to be set for him and finally to get arrested. The Caliph confident that Ioannis had betrayed him, ordered to cut his hand as it was done. Ioannis constantly prayed in front of this picture asking the Virgin Mary to cure him. The next morning when he woke up his hand had treated and wanting to thank the Virgin Mary, he made a silver copy of his chopped hand and placed it in the picture. Since then it stayed in the picture and hence the picture was called Virgin Mary the 'Tricherousa' (with three hands). 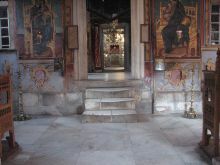 The Virgin Mary is celebrated as an Abbess from the time when the monks tried to put the image of Panagia Triherousa at the iconostasis of the Katholikon and the holy picture disappeared and reappeared at the throne of the abbot. The miracle happened three times and the monks accepted it faithfully and with reverence by giving their 'Abbess' the position it was asking.